DIY Magnetic Hand-Saw Guide - Extremely Accurate Cuts! I think handsaws are WAY better than circular saws for many reasons, but I always come across one problem: I'm never able to saw perpendicular, aka square, at a 90° angle. You can see the example for this here. I have (finally!) received the saw that I won back in the 2015 Shelving Contest with my Ultimate Magnetic Pegboard. It's extremely sharp, beautifully made, and has a really comfortable handle. However, it is very thin, and doesn't have any aligning support on the top, so it bends really easily while sawing. One day I was daydreaming a bit: "If I take that magnetic dovetail jig that I saw in one of Jay Bates' videos, and align it differently, will I be able to use it for sawing at 90°, perpendicular, and square to the wooden board that I'm sawing?" So I do a quick search and: "Wait, WHAT? It costs 50 DOLLARS?" "OK, nevermind. I'm making my own!" I decided that I'd make myself a magnetic guide, which ensures that the cut will be square in all directions. Alternatively, you can modify it, and use it for dovetails, miters, or anything else. Below is a list for everything you'll need to complete this project. If you don't see something that you think should be here, please let me know in the comment section below. If you would like to know more about a specific tool/part that I used, feel free to ask in the comments. I found a magnet that I had salvaged from a hard drive which I thought would work well. I don't have a pictures of removing the magnet from the other metal part (ferrite?) because I did this a long time ago, but Ben has a great tutorial. See step 1. Since I didn't have a saw that can actually saw wood accurately, I needed to find a piece of wood that was accurate. I looked through my collection of wood until I found an accurate one, which happened to be a leg of a chair that I had taken apart. This chair was made of European Beech. I sanded both the endgrain of the chair, and the magnet, until I saw that a bit of material had been removed. This is a very important step, because it allows the adhesive to adhere significantly better. I used silicon carbide sandpaper, which I estimate was about 200 grit. Step 5: Epoxy-ify Them Together! I finally stuck the magnet onto the wood, and cleaned the part of the magnet that was exposed. If I recall correctly, these magnets are made of really hard material, meaning that they might scratch the saw. The magnet is also really strong, so I thought it would be a good idea to reduce the friction somehow. After letting the Epoxy cure for a few days, I got back to work. I found some type of synthetic towel, which I thought would work well. I cut it to the size that I wanted, and applied contact cement to one side, and onto the magnet. About an hour later, I stuck them together. As you might remember, the piece of wood that I used was an old chair leg, meaning that it was pretty big. Here, you can see why you MUST wear a welding mask when I saw! Step 8: DONE! | How to Use It | Examples | Video! If you LOVE watching horribly edited videos, you can click here to watch my video about it. If you liked it, make sure to check out my new YouTube Channel, as I upload quick videos of my projects in action, and more! To use it, first, you need to mark a line, which represents the angle that you want to cut. This can be done with a speed square. After that, you need to clamp both the guide, and the board onto your workbench. Nw you can start sawing! You'll be amazed at how accurate the cuts are! Do whatever you want with it: crosscuts, dovetails, miters - Anything! Are you a hand-tool expert? Leave your handsaw tips in the comments below! I read ALL comments, and reply to as many as I can, so make sure to leave your questions, suggestions, tips, tricks, upgrades, improvements, and any other ideas in the comments below! - Thanks! I'm giving a FREE 3-Months PRO Membership to the first member that makes their own magnetic saw guide! Are any of those free codes still available? I've already given the free membership for this I'ble away (to srilyk), though the giveaway is still available for many of my other Instructables. Here's a link to the saw guide in case anyone's interested. Unlike a miter box, this guide can use a board as a fence and do accurate cuts of unlimited length. Great DIY idea. I will be making one. Thanks for sharing the idea. I will make one, soon enough. You really knocked off a great tool even one should have. I think the Vertas tool is great but for el-cheapo people like myself, this is better. Below are comments saying to use square tubing, don't buy ot, look around there are many sources for free, some baby carriage styles, some umbrellas just to name two. I have used them for other things myself! Your idea is simple & effective. Comments/questions. You use a square cut piece of wood to mount the magnet, but how do you know the magnet is square after you glue it? Thought about embedding the magnet in the wood? If slightly below the surface the squareness is preserved and scratching of the saw minimized. The addition of material to cover the wood would still be a good idea. Thanks, Why wouldn't it be square after I glued it? forstner bits work great for that purpose! It might not be square because the glue under the magnet may have a slope to it. Glue tends not to evenly distribute unless the pieces are clamped square while the glue dries. Thank you again for your instructable. I wasn't able to clamp it properly, but I guess that would be an issue if I was looking for extreme accuracy. You could use part of a steel square tube. Put a magnet on it which would magntise the whole thing. It would do the same thing and last longer. Or just use a square. Your main problem is this "However, it is very thin, and doesn't have any aligning support on the top, so it bends really easily while sawing." Even with a square you make the job harder with a flimsy blade. I would get a better saw with a thicker blade. It will make your sawing easier. Note that this saw is a Japanese-style saw, i.e. it cuts on the pull stroke. It's only going to bend if you're sawing improperly, trying to cut on the push stroke. They're designed that way because with a pull stroke you can use a thinner blade which means a thinner kerf and less waste material. Yes, I have some Japanes style saws. They are good for somethings and push saws are good also. 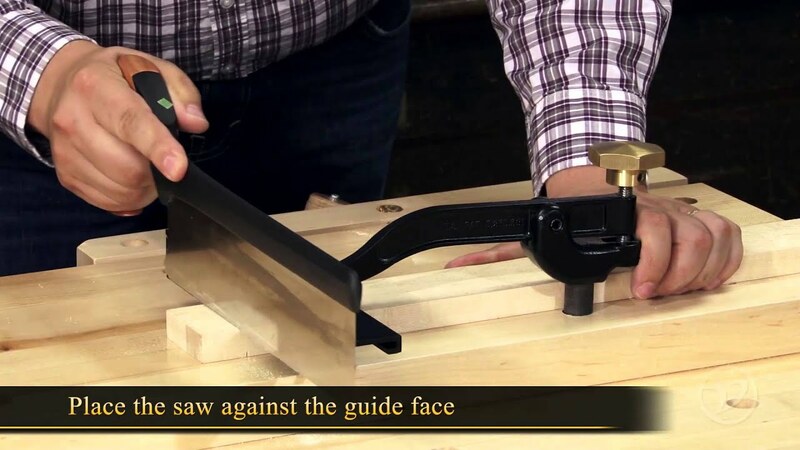 And yet at the beginning of your instructable, you indicate the need for your square because of your saw bending: "However, it is very thin, and doesn't have any aligning support on the top, so it bends really easily while sawing." So are you saying you are sawing wrong? I think you came up with a nice solution for a problem you were experiencing with your saw. I think it will help others. There are other solutions. All I am saying to other people if your saw is bending other people may want to consider a thicker saw and a push saw. I say if your setup works for you do not change it. As far as as less waste material (saw dust) between a thinner blade and a thicker blade, at least for me it is of no concern chopping off the end of something.